Savory snacks with dairy ingredients offer salty, melty, crunchy, creamy satisfaction with a nutrition bonus. Consumers are paying closer attention to food labels and demanding more natural and nutritious foods. This trend should prompt snack manufacturers to boost the nutrition of their lineup. – Laura Gottschalk, U.S. Dairy Export Council's U.S. Dairy Ingredient Program. Whether eaten between meals, with meals, hot, cold, at home, at work or on-the-go, snacks are a mainstay in the American diet — and a lucrative niche for food processors. The healthy snack foods market alone is a $29.5 billion industry, according to a recent Mintel report. Food formulators can select from a variety of naturally nutritious dairy ingredients including cheese, yogurt and whey protein, a high-quality protein found in dairy. Savory snacks with dairy ingredients offer salty, melty, crunchy, creamy satisfaction with a nutrition bonus. In the development of lower-fat and healthier snacks, the right flavor and texture can make a product significantly more appealing than the competition. The Mintel study on healthy snacking also concluded that taste/flavor and appetite satisfaction are the most important factors for the vast majority of consumers when choosing snacks. According to the survey, 84 percent of respondents listed taste/flavor as the top attribute they look for when choosing healthy snack foods. The Mintel study indicates consumers are unlikely to purchase snack foods they do not find tasty. It also reveals that consumers see less risk in trying a new product if the product has flavors they generally find appealing. Cheese can be added to snack applications for improved flavor and is available in many forms to fit with the application goals of a product developer. In their traditional form, parmesan and cheddar cheeses in particular offer a saltiness and chewiness to breadsticks, crackers and warm appetizers. A snack that incorporates 5g of grated parmesan cheese will provide between 2 and 6 percent of the daily values of protein, calcium and phosphorus. Product developers can use cheese powders, or dehydrated cheeses, to introduce a new version of an established snack food with added consumer appeal. Enzyme-modified cheeses blend natural, food-grade enzymes together with natural cheese to provide intense flavor profiles for snack products. Nutritious snacks are not just about enjoying guilt-free flavor. According to Snacking Market Structure, a consumer behavior study by NuVista Strategies Inc. and sponsored by Dairy Management Inc., consumers listed 51 percent of their snacking occasions were for nutritious reasons. The snacking study indicates consumers are looking for flavorful snack options that can help them stay within their nutrition intake goals. Dairy ingredients can help snack manufacturers achieve this balance. Mintel's healthy snacking report found the promotion of functional benefits in snacks is becoming commonplace through fortification of products and by manufacturers giving more attention to the natural benefits of their existing ingredients. Dairy ingredients offer nutritional substance and consumer desirability and are often perceived as more wholesome and less processed than other snack ingredients and foods, according to Laura Gottschalk, vice president of strategic market research, U.S. Dairy Export Council's U.S. Dairy Ingredient Program. "Utilizing low-fat dairy products as an ingredient is a natural way to reduce calories and fat while maintaining the flavor, texture and nutrition consumers are looking for in a healthy savory snack," Gottschalk says. Yogurt or sour cream can be used as a main ingredient in dips and dressings, which are great to accompany favorite snacks such as chips, pretzels and vegetables. Yogurt-based dips have been found to reduce the fat by more than 50 percent compared to regular dips, while maintaining all the creaminess and rich flavor of the original product. According to Kimberlee (K. J.) Burrington, dairy ingredient applications coordinator at Wisconsin Center for Dairy Research, Madison, Wis., whey protein is another dairy ingredient that plays an important role in snack product development. "Whey protein can increase crunchiness and nutritional content of chips and crackers and, depending on the amount used, can provide another high quality protein source for snackers hoping to boost their protein intake," she says. Whey protein is also available in crisp form to add texture variety to salty or sweet snacks and nutrition bars. When it comes to savory snack cravings, consumers want to satisfy hunger and taste buds while striving for a healthier diet. 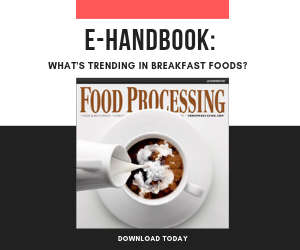 The popularity, functionality and nutritional content of yogurt, cheese and whey protein ingredients continue to provide opportunities to leverage this evolving food category. Sharon Gerdes is a food industry consultant who works with the U.S. Manufacturing & Ingredient Marketing program at the U.S. Dairy Export Council to promote the use of dairy ingredients in food and beverage formulations. Deputy Commissioner for Foods outlines accomplishments, to-do list. New research returns dairy to the forefront of conversations involving diet and health. How Concerned Are Consumers about Food Safety? Food processing flavors that make consumer's mouths go mmmmm.